I'm beginning to feel sorry that I ever complained about how slowly the Schlumbergeras were blooming. They've certainly picked up speed since. 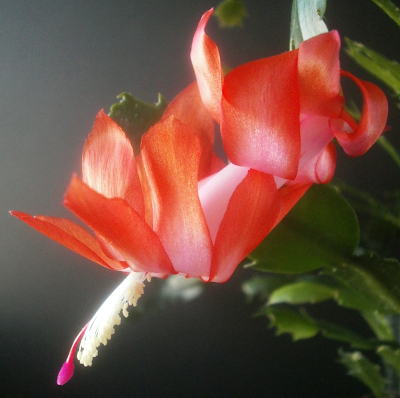 As I write this (18 November), blog posts are already planned out through Boxing Day, and twelve of those posts are for new Schlumbergera seedlings.1 I mean, I guess I'm happy to be seeing new blooms and everything, and I do have time to write the posts: it's not really a crisis. But keeping track of where all the posts are, and how close they are to being finished, is sort of overwhelming. 091A is okay. Hard to be too impressed with it, at this point -- it takes a lot more for a seedling to stand out now -- but there doesn't seem to be anything especially wrong with it, either. Sometimes the right name can make a big difference, though; maybe 091A will be lucky. Let's find out. All Bath Toy has going for it is that there are almost certainly bath toys for children with these colors. I don't like it otherwise, and the name wouldn't have made the short list except for the fact that most of the long-list options were even less appealing. Pepperland would make a lot more sense for a red flower. I mean, I'm aware of orange peppers, and even occasionally pink peppers, but they're not what I think of when I think "pepper." Also, I think almost any word would pair more interestingly with "pepper" than "land" does. 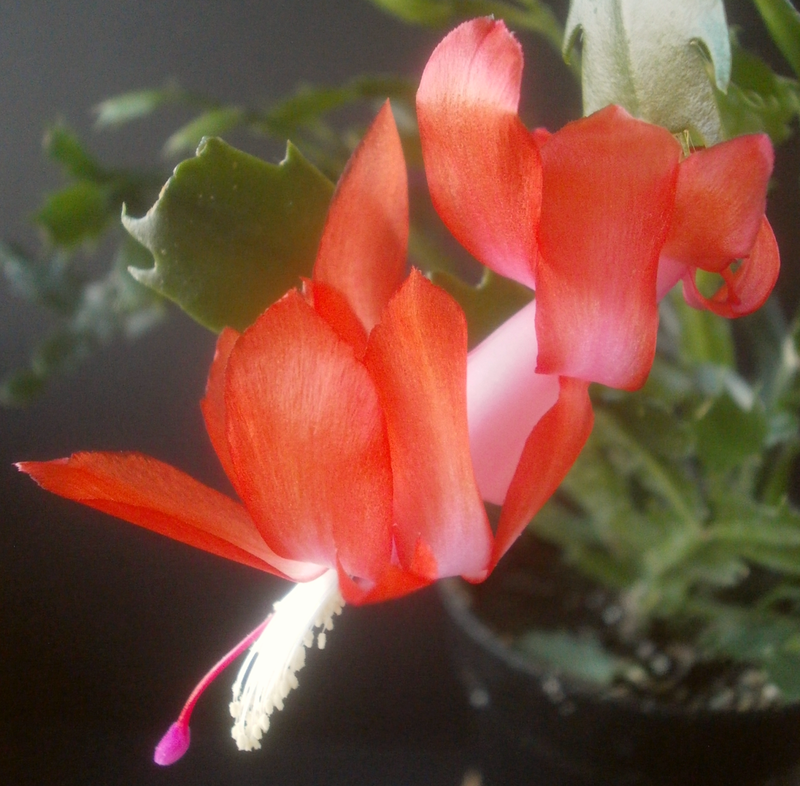 They're cool animals, and not thought about nearly often enough, but I reject Hummingbird Moth on the grounds that I got another animal option from TinEye that does a better job of imitating Schlumbergera blooms' shape. Perhaps some other seedling, some other day. The colors are plausibly circus / carnival / fair sorts of colors, so Funhouse could maybe be appropriate, but I . . . kind of hate funhouses? There's nothing dramatically wrong with Dream Haze as a name, but I can't come up with anything especially positive to say about it either. At this point, I suddenly realize that I've decided on a name without being consciously aware of doing so. For the sake of completeness, the other options were Rumble Strip (also, also), the name for the sections of road that make low-pitched buzzing-type noises when you drive across them. Naming a seedling after them might have been a useful way for me to remember what they're called, but I wasn't really feeling a connection between the name and seedling. Genesis is not obviously wrong, and abstract enough to be able to fit anything, but I wasn't thrilled with the connections to the Bible and the rock band, not to mention the thousands of other things named "Genesis." And the seedling hasn't generated much of anything so far, either, as far as that goes. Finally, Young Hollywood (also), which I can kind of see a connection between the bloom color and all the neon signs of my imaginary Hollywood, but I feel like young people, Hollywood, and young people in Hollywood all get plenty of attention already and don't need a seedling too. Which leaves our winner: Flying Fish. The color is not related at all (the photo is of a meal from a restaurant called "Flying Fish;"2 actual flying fish are silver), but do an image search for "flying fish" sometime and tell me you don't think their shape is evocative of Schlumbergera blooms. 1 Also one Anthurium, and seven orchids. I even have plans for three posts about plants that are none of the above. 2 I still don't understand the impulse to photograph one's meals, for the record. 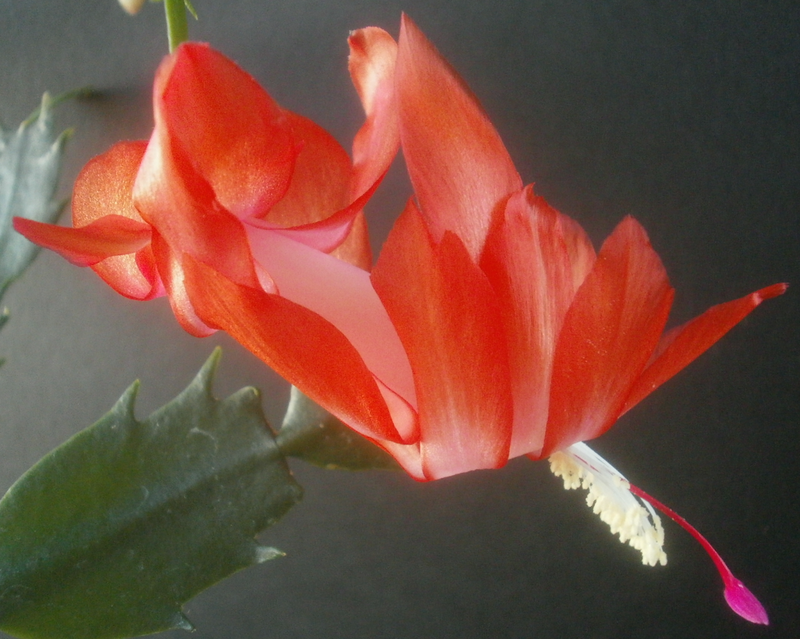 The first bloom began to open today, in fact. I had sort of convinced myself that it wasn't really as incredible as I had imagined at first, that the magenta was some camera artifact or whatever, but no, I was blown away by it all over again. It's got maybe 3 or 4 additional buds on it, as well.